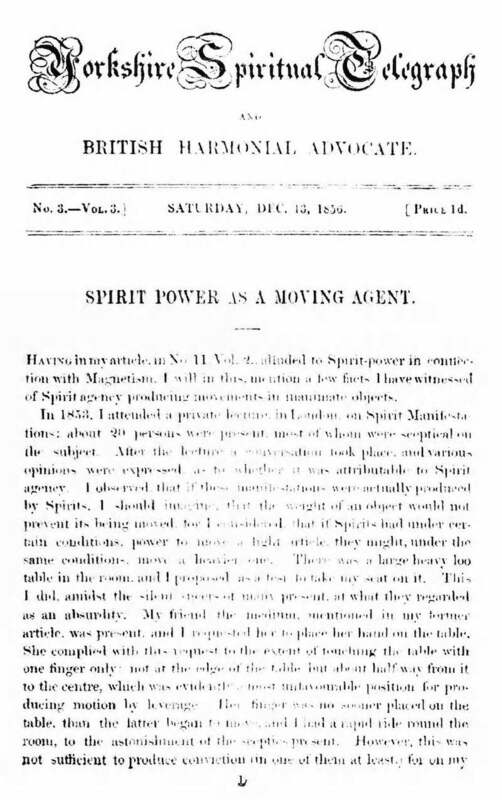 Summary: Along with The Community's Journal and The Spiritual Herald, one of the trifecta of important early English Spiritualist newspaper. Yorkshire Spiritual Telegraph and British Harmonial Advocate, The. Containing a Number of Extraordinary Communications from the Spiritual World. 1/1, April 1855-June 1857. 10-12 pp., 1d. a copy. Occasional Supplements on particular subjects (e.g., "Spiritualism versus Liberalism"). David Wilkerson Weatherhead (d. 1875) was a wealthy industrialist from Keighley in the Midlands. He was a leading provincial "secularist" of the time and when he was converted from "secularism" to spiritualism he promptly went out and bought a printing press and font of type and dragooned one of his workers (Benjamin Morrell, one of his shopmen) and his two daughters into printing the journals, rather ungraciously adding to each issue "D.W. Weatherhead, Printer, Keighley." He continued the enterprise at his own expense until The Spiritual Magazine appeared in 1860 and he abandoned the struggle. Extensive reports on seances with notable spirits (Swedenborg, Martin Luther, Robert Burns), correspondence with many who were or who would become well-known (Robert Owen), instructions on forming circles, reports of mediums, notably P.B. Randolph and D.D. Home, and of developments in the new movement ("Shaking Hands with a Spirit," etc.). Unlike most other British journals, this is largely a working-class effort. Oppenheim sees in the journal the influence of Robert Owen on the development of provincial spiritualism, and Robert A. Gilbert emphasizes the partisan New Church emphasis of the journal derived from its Swedenborgian editor John Garnet. Gilbert, "Magus Incognito." In its first year the journal claimed to have a circulation of 2,000 throughout the British Isles. LOC; Yale University; ZDB: Freiburg Inst Grenzgeb Psychol.